For a company that was only founded in 2014, PTZOptics had a team of experienced engineers on hand. They knew how to build and design good PTZ cameras long before the solar panels at their headquarters (Yes, the majority of their office in Downington, PA is powered by the sun.) were ever installed. That being said PTZOptics builds solid cameras for a good price. Since we are a PTZOptics Authorized Dealer, we also know how to best integrate with their line of products. For starters, what is a PTZ camera? PTZ stands for Pan, Tilt and Zoom. This basically means that a single user can remotely adjust all three movements- in addition to adjusting focus, assigning preset positions and even controlling multiple cameras at once. This is why PTZ cameras are popular in Houses of Worship, municipalities or any place where multiple camera angles are desired, but staff might be limited. PTZOptics not only builds cameras to address the need for control, but they are also very competitively priced and offer amazing installation flexibility. SDI Models: Available with either 12X, 20X, or 30X optical zoom, these cameras are broadcast ready. Complete with HDMI, 3G-SDI, PoE, IP Control and streaming directly from the camera (h.264 and h.265), these cameras are ready for installation into any venue. USB Models: Producing the same 1080/60p image quality as the SDI models, these cameras are a big upgrade to a traditional conference room camera. These cameras are available with either a wider angled 12X optical zoom or a 20X for closeups. Although these cameras were designed for USB 3.0, in-camera streaming (h.264 and h.265) and an HDMI output are also included. NDI Models: Although these cameras take full advantage of NDI technology, they still kept all of the great features know with PTZOptics. Full HD in 1080/60p, IP streaming (h.264 & h.265), 3G-SDI, HDMI, and PoE are still included for a great price. 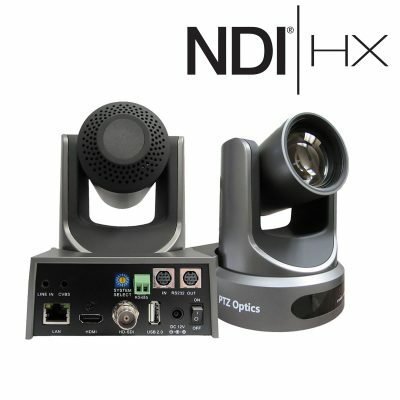 Chose between 12X, 20X, or 30X optical zoom, and these NDI cameras can go anywhere. 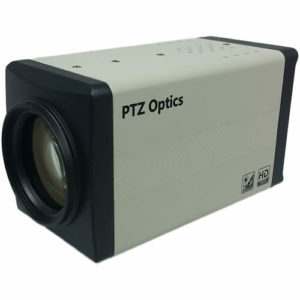 ZCAM Models: Packing most of the great features of the PTZ cameras, the ZCAM offers a lot in a well-priced box camera. Available with either an interchangeable fixed lens, or an integrated 20X optical zoom, the ZCAM models fit a variety of applications. Given the amount of features offered in each camera and flexibility in applications, PTZOptics offer the right solution for the right price. Stream Dudes knows how to get the most out of PTZOptics cameras, so Contact Us to learn more about specific workflows.